The album is titled For Ever and is released via XL Recordings. 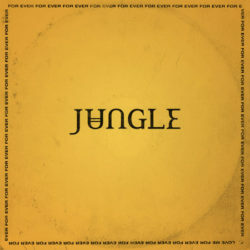 If Jungle’s first album was their imaginary soundtrack to the places they had never been, For Ever is inspired by real life experiences of the places they’d dreamed of for so long. Swapping Shepherds Bush for the Hollywood Hills, J and T set up camp in Los Angeles to write and record the album. Over time however, their romanticization of The Californian Dream clashed with the reality of actually living it, the feeling of being adrift on the West Coast compounded by the collapse of long-term relationships. Returning home to London, they teamed up with highly regarded young producer Inflo where they sought to create a “post-apocalyptic radio station playing break up songs”, whittling down loads of ideas this concept spawned into the core 13 tracks you have before you. That station and those songs and that journey are the sound of Jungle’s second album For Ever. They had to go away to come home. And what J and T lost in love, they gained in music. For Ever is for real, deeper and higher, more intimate and more expansive, feelgood and, just occasionally, feelbad. It is, then, a proper second album.